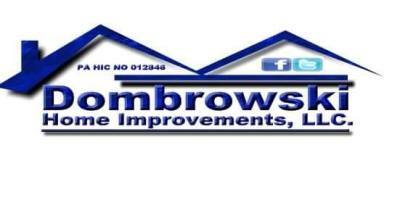 Dombrowski Home Improvements, LLC takes great care and pride in the work we do. Since 2008 our company has been founded on high quality craftsmanship, and in that spirit lives on today with the modern service we continue to provide our customers today. Feel free to read what some of our customers have said about the services provided by us, we hope you'll be able to say the same! From the initial meeting to the final touches, communication was outstanding, work was timely and clean up occurred every day. Frank has vendors for tile, cabinets, and granite that have super selections and very informative employees that made suggestions that enhanced our design. Frank showed up every day and did not run from job to job; our project was his only concern. We were happy with the value of the project and would definitely hire him for future projects. I highly recommend Frank Dombrowski. He is easy to talk to, he understands his clients, and he goes out of his way to make suggestions with an understanding of your timing and your budget. Everyone told me to budget 10% more money and 2 weeks more time than estimated for my kitchen remodel. But Frank was right on target with the budget, and he finished ahead of time! I was absolutely delighted with the remodel, and his ideas (I am simply NOT the most creative person!) made my kitchen remodel the kitchen o my dreams. Finally, I would like to comment on Frank's integrity and work ethic, which are superior: he always informed me of what would be happening and when, he was imminently trustworthy, and he went above and beyond my expectations. I will be highly recommending him to my friends and colleagues. You should hire him; it is an investment worth waiting for. Great price and excellent communication. Service was delivered exactly as promised - on time and within budget. Frank came to my home for the initial consultation and showed a true interest in my remodel. He took the time to explain things in detail and provided a written estimate. Once he started the project, he kept me updated on the process as to what I would expect on a daily basis. He even told me to report to him anything that I viewed as a concern and it would be addressed promptly. A true professional and a credit to his trade. My wife and I contacted 12 contractors for our basement remodel project. Frank was extremely responsive, explained everything and we had a good feeling right from the beginning about him. After narrowing it down to a few, we selected him. Our basement remodel project couldn't have gone better, and we are very pleased with the work Frank and his team did. They were on time everyday, on budget for the project, not a nuisance at all and ended up finishing 2 days early. We were so pleased with the work he did for us in our basement, we had him do two extra projects while the time permitted; installation of a storm door and recessed lighting in our living room and painting of the ceiling. There were a few small spots on our ceiling that needed to be touched up, and even though the job was technically "finished", we asked Frank if he wouldnt mind coming back to just touch them up and he immediately agreed, no reluctance whatsoever...and at no charge. What more can you ask of from your contractor? Excellent pricing and service set Frank apart. We would 100% recommend him to anyone, and in fact have done so already. We plan on bringing him back in a few months to do more recessed lighting too. I've seen the other negative reviews on here and have to say they must be BS, as they are totally out of character. If your considering any work in your house, Frank is the guy to call. I am giving my highest recommendation for Frank Dombrowski and Dombrowski Home Improvements. My wife and I wanted the basement finished and contacted over 4 contractors for the job. Frank came in on time and on budget, and always went the extra mile to make sure the job was to my satisfaction. I have dealt with many contractors in the past and what sets Frank apart is that he constantly communicates with you through every phase of the project so that you know what's next. This allowed for a single vision throughout the work with no need to go back to correct (for anyone who's dealt with a non-communicative contractor you will know what I am talking about). Frank brought his own ideas to the table, most of which we adopted because they were well thought out about how we were going to be using the space. Frank was ALWAYS on time and never missed a day. I will also give a big shout out to Mike, who did much of the actual framing, tile ceiling layout and flooring - he knew his craft! The finished product was amazing, and Frank even helped me with some finishing touches not called for in the original contract, and helped me move and hang a large flat screen television (thanks Frank). My wife even commented that that finished product was better than she had originally envisioned. I will be doing a bathroom and kitchen remodel sometime in the future, and you best believe Frank is the person I will call to complete those projects. I saw a review from some woman who said that Frank was not on time and not professional -- something tells me she miscommunicated something because that is not the person I dealt with. Frank and Mike - amazing job. P.S. - my neighbor hired Frank for some light projects while he was doing my remodel on my recommendation and also had nothing but good things to say. Communication and good work is key when it comes to a business. Both of these far exceeded me and my wife's expectations. After inquiring about some trim work to be done, i received an email within a few hours from Frank offering to stop by our house for a free estimate. Within a week or so, our family room was completely redone with base/crown molding, trim around our sliding glass door, and even fixed issues with our ceiling from issues we had with a previous contractor. I would recommend Frank and his company to anyone looking to make their house a home. We'll be using him for other projects in our home. Frank did a wonderful job of remodeling my bathroom. He and his helper, went above & beyond, as far as I am concerned. There were very industrious and efficient. Honestly before we called and made an appointment with Frank I did my research when it came to googling contractors and reading reviews. After reading the reviews for Dombrowski Home Improvements it was a no brainer to call and have Frank come out for an estimate. Upon meeting Frank you notice a few things right away. He was punctual, informative, courteous, well spoken( a great communicator but more about that later). When Frank looked at the space he right away was informing us about some potential obstacles we may have due to the small space of our kitchen but he had ideas on how we could work around it and make the most of our space. He is very knowledgeable! We had other contractors come out but the differences were night and day as far as their ideas to maximize the space and even the estimate/ proposal. Franks proposal was VERY detailed compared to the others that were very vague. There were so many things Frank did well and one major one was communicating. He would show you at the end of every day what he had done and what he was anticipating on working on tomorrow. Always keeping you informed! His attention to detail, punctuality, communication skills, craftsmanship, his genuine concern as if he were doing the work in his own house . These are some of the ways we would describe Frank. You should add making dreams come true to your truck!! The kitchen was a dream for my Mom and you made her dreams come true! We would not hesitate to hire Frank again or to recommend him.